MovementWorks provides undergraduate and postgraduate level lecture seminars on PE research, neurophysical research and its relationship to Developmental Dance Movement®. These lectures are of particular relevance to courses in Dance Science, Dance Teaching, Physical Education and Sports Science, Early Years Education and PGCE Courses. 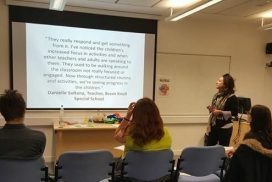 'Dance Movement as intervention for children with ASD - new approaches and perspectives' at Greenwich University. A presentation for 'Comparative Perspective on Autism and Well-Being' at New York University London. Please contact us for further information. Fill out the form below, or send an email to info@movementworks.org. Interested in seeing our work in action or booking a workshop or course for your school? Leave your details below and we’ll get in touch with you.